Producer: Barbet Schroeder; screenplay: Eduardo de Gregorio, Juliet Berto, Dominique Labourier, Bulle Ogier, Marie-France Pisier, Jacques Rivette, with sections based on original stories by Henry James; assistant directors: Luc Beraud, Pascal Lemaitre; photography: Jacques Renard, Michael Cenet; editor: Nicole Lubtchansky, Cris Tullio Altan; sound recording: Elvire Lerner; sound editor: Paul Laine, Gilbert Pereira; music: Jean-Marie Senia. Cast: Juliet Berto ( Céline ); Dominique Labourier ( Julie ); Bulle Ogier ( Camille ); Marie-France Pisier ( Sophie ); Barbet Schroeder ( Olivier ); Philippe Clévenot ( Guilou ); Nathalie Asnar ( Madlyn ); Marie-Thérèse Saussure ( Poupie ); Jean Douchet ( M. Dédé ); Adéle Taffetas ( Alice ); Anne Zamire ( Lil ); Monique Clément ( Myrtille ); Jérôme Richard ( Julien ); Michael Graham ( Boris ); Jean-Marie Sénia ( Cyrille ). Carney, Raymond, Magill's Survey of Cinema: Foreign Language Films edited by Frank Magill, New Jersey, 1985. Rodowick, David Norman, The Difficulty of Difference: Psychoanalysis, Sexual Difference, and Film Theory , New York, 1991. Jacques Rivette: la règle du jeu , Turin, 1991. Delmas, J., Jeune Cinéma (Paris), July-August 1974. Variety (New York), 21 August 1974. Cornand, A., Image et Son (Paris), September 1974. Frot-Coutaz, G., Cinéma (Paris), September-October 1974. Tournes, A., "Un dans trois, Rivette," in Jeune Cinéma (Paris), September-October 1974. Rosenbaum, J., "Work and play in the house of fiction," in Sight and Sound (London), Autumn 1974. Jordan, I., "Entretien avec Céline et Julie," in Positif (Paris), October 1974. Lénne, G., "Céline, Jacques et Julie," in Ecran (Paris), October 1974. Legrand, J., "Un film est un complot," Positif (Paris), October 1974. Ashton, J., "Reflecting consciousness: three approaches to Henry James," in Literature/Film Quarterly (Salisbury, Maryland), Summer 1976. Milne, T., Monthly Film Bulletin (London), August 1976. Gow, G., Films and Filming (London), November 1976. Lesage, J., "Subversive Fantasy," in Jump Cut (Berkeley), March 1981. Wood, R., "Narrative Pleasure: Two films by Jacques Rivette," in Film Quarterly (Berkeley), Fall 1981. Levinson, J., Celine and Julie Go Story Telling," in French Review , vol. 65, no. 2, 1991.
subversive fabulists in their own right, and a uniquely serious frivolity that makes the film an enormously pleasurable fictional do-it-yourself kit. From the title onwards, the film appears to celebrate child-like leisure and gratuitousness. The heroines do, at the end, literally go boating, but "aller en bateau" also means to be taken for a ride, to be told a shaggy dog story; this tale is a winding river on which we, like Julie, are led into uncharted territory. The film begins with her sighting the elusive Céline, who, in one of many allusions to Alice in Wonderland , is the White Rabbit leading her into a narrative labyrinth. Becoming friends, counterparts and arguably lovers, they make a series of visits to a mysterious house in which a family of 'ghosts' continuously reenact a melodrama, as if trapped in their own dislocated matinee performance. This uncompleted story concerns an endangered little girl, and its heroine, an empty role to be filled by Céline and Julie, is her nurse and rescuer Miss Angèle Terre ( mystère , but also mise en gel —frozen). There are two (by no means incompatible) dominant critical views of the film. One sees it as a self-reflexive commentary on the pleasures of cinema and the spectator's active role. For the other it is an exemplary feminist narrative in which two women control the fiction-making process and challenge male orders of various kinds— including that centred around the myth of the omnipotent director. 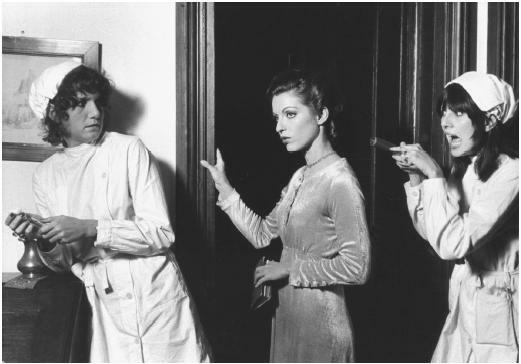 The film's authorship belongs as much to the two leads as it does to Rivette, whose role, according to Juliet Berto, was akin to "surgery," cutting the material they provided into a coherent, if wilfully ragged pattern. The main writing was undertaken by Berto and Labourier, who planned their characters and the overall narrative shape with Rivette; Eduardo de Gregorio provided the structure for the interpolated narrative, drawing on Henry James's stories "The Other House" and "A Romance of Certain Old Clothes." With the exception of one improvised scene (Céline lets her mythomania run riot on her incredulous friends), what appears to be improvisation was in fact thoroughly scripted before shooting. In the narrative as much as in the process of making the film, "improvisation"—an effect rather than a fact of performance—can be seen as an inventive engagement with a predetermined form, a sort of manoeuvring around a written score that constantly demands to be remade, just as the fragmentary story in the house is constantly reshaped, jigsaw-fashion. The film provides various analogies for such inventiveness: magic (Céline's conjuring act), song-and-dance (Julie's audition as a singer) and tarot reading (inventing meanings from a limited set of cards—a traditional figure of the art of combination). Filmmaking and film watching are presented as similar and complementary processes of participation, continuous acts of mental editing: both living and watching the story of the house, Céline and Julie try to make sense of the disjointed footage that passes before their eyes. Despite the apparently ad hoc nature of its conception (Rivette and Berto got the project going from scratch when another film fell through), Céline et Julie has a central place in Rivette's oeuvre. It is one of many films (from Paris nous appartient to his 1995 musical Haut bas fragile ) in which young women contest patriarchal orders by throwing themselves into intrigues as fiction-makers. It is one of many in which the performers contribute to the writing, and in which the characters appear to evolve from their personalities. And, although the film could be read as being exclusively about cinema, it also concerns the relation between the real world and theatrical performance within an enclosed space. Where L'Amour fou and others are built around specific plays, the exorcism of the house is theatre in broader terms (as the two women play Angèle, we hear audience applause). The film opposes two types of performance—the traditional style, in which the ghosts act out a stultifying, stylised melodrama about a nuclear family; and an anarchic improvisational style akin to the 1960s/70s notions of free theatre. Céline and Julie not only reconstruct the shattered text they perform in, but also deconstruct it, disrupting the family's stately dance by launching into a screwball tango. They are Marx Sisters, if not Marxist sisters, shattering the sexually and socially oppressive order of the house and of a certain school of classical fiction. One other aspect of the film that has come into its own, in the two decades since it was made, is its Proustian quality, its function of preserving the past. Madlyn is a madeleine retrieved from lost time, and the house is obscurely linked to Julie's own childhood. The circular ending suggests a present transformed by the retrieval of memory; Céline and Julie swap places and begin the story again. But the Proustian aspect also lies in the film's power of evoking the time and place of its making (not least through Berto's hippie-chic wardrobe). It conveys a very tangible sense of a dead Parisian summer in the early 1970s, of empty spaces and malleable time in which to indulge creative leisure (Julie abandons her librarian's post to make her own lived fiction). Characteristically charging banal locations with a sense of privileged "otherness," Rivette recreates Paris as a fictional space that paradoxically derives its magic quality from a heightened realism (the documentary style of Jacques Renard's photography). This is especially evident in the use of peripheral incident (notably, a cat's movements in a garden) in the opening chase sequence. The film is about space, both literal and imaginative—over three hours, the space for the viewer to take a holiday from adulthood, as Céline and Julie do, and rediscover the infantile but empowering pleasures of "irresponsible" fiction-making.